The giraffe is, quite obviously, a unique species. It was probably one of the first, just so, stories in biology. Lamarck used it to promote his Laws of the Adaptive Force. Those laws (which isn’t really a law, because it’s wrong) say that organisms which use their organs frequently will encourage the growth and strengthening of those organs. The reverse is also true. Infrequent use of an organ will result in atrophy. His second law says that those organisms can pass the strengthen (or weakened) organ traits to their offspring. The giraffe is supposedly an example of this. The giraffe stretches its neck to reach tall branches and its neck actually gets longer. That longer neck is passed down to offspring which also stretch, etc, etc, etc. We know this to be wrong, even at a basic level. People who have lost limbs to injuries don’t pass that lack of a limb to their offspring, for one example. But the giraffe is still an amazing animal. The family giraffidae includes only two extant species. The giraffe, Giraffa camelopardalis, and the opaki, Okapia johnstoni. There are several extinct species, as well. We know by looking at other taxonomic families that a family can be very diverse. But the opaki and the giraffe are really different. 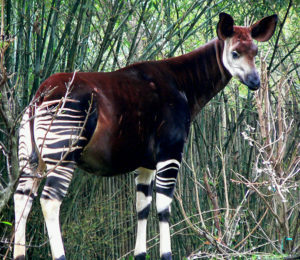 An Okapi. Taken at Disney’s Animal Kingdom by Raul654 on January 16, 2005. I just happen to like the pattern on the masai subspecies. But there’s some amazing structures behind the giraffe’s uniqueness. First, it’s heart has to pump blood nearly straight up, 2 meters, to get to the brain. It has to both grow and support the unique body structure. It looks fragile, but a giraffe can run sprint to almost 40 mph and can run at 30 mph for several miles. The nervous system has to send signals over long distances, with some unusual evolutionary results I’ll talk more about in a second. Finally, the giraffe eats acacia leaves and seedpods, which are highly toxic to most other animals. One unique feature of giraffes, which is clearly due to evolution and not design, is the recurrent laryngeal nerve. In all all animals, this nerve connects the brain to the gills. In fish, the nerve moves from the brain, right past the heart, to the gills. But in tetrapods, which have co-opted the structures for gills for other purposes, the nerve has a curious detour. In mammals, the nerve extends from the brain stem, under the aorta (that big vessel directly above the heart), and then up to the larynx. This nerve controls the vocal cords, among other muscles in the area. In humans, the nerve is about a foot long. Evolution doesn’t ever start from scratch, but instead modifies what’s already present. It would make sense, from a design perspective to stop the nerve from running under the heart, then back up to the throat. That’s a few inches on the direct route. But all tetrapods have this odd nerve. In the giraffe, the nerve is about 15 feet long. Because it has to run from the brain, all the way to the heart, then back up to the throat. Of course, that’s not that big a deal. In Supersaurus the nerve was estimated to be about 92 feet long. What caused all those changes? The cardiovascular system, for example, has a heart with an enlarged ventricle for pumping, a blood pressure that twice as high as any other mammal, thicker capillaries to withstand the pressure changes when it lowers its head nearly 20 feet to take a drink. The other systems are as highly derived. The authors of the paper I want to share with you decided to find out. They did a full genome scan of a couple of giraffes and opaki. Then compared the two sequences. First, based on non-mitochondrial DNA, they estimate the divergence of the giraffe and opaki at about 11.5 million years ago. Much less than previous estimates. Then they analyzed the genes extracted from the giraffe and opaki (and some cattle) to determine exactly which genes are different. Those different genes, if evolution is correct, would explain why the giraffe is so different. They found 70 genes that were significantly different. 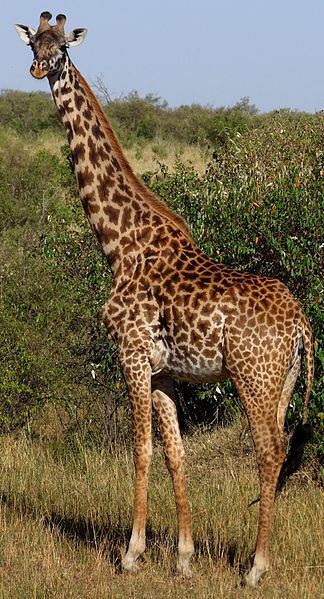 They confirmed that those genes were not just random mutations by looking at other subspecies of giraffe and confirming that the same sequences where in those subspecies as well. The authors provide a list of the genes, which is pretty meaningless unless you know what all the abbreviations mean. But the summary is pretty fascinating. All 70 genetic differences were clustered in 8 functional areas: development, cell reproduction, metabolism, circulation, nervous system, DNA break repair, immunity, and centrosome function (centrosomes regulates cell division). Almost half the genes are directly related to development of the organism. In genetics that means things like how individual structures develop from cells, growth, increase in size, and changes from zygote through adulthood. The authors go into significant detail on the genes that are changed, what those genes control during development, and what the changed gene means to the development of the giraffe. One example should suffice here and the paper is free for download. There are eight genes involved in the cardiovascular system. Including BORG1 and RCAN3, which are highly expressed in the giraffe heart. These genes are thought to be heavily involved in cell shape and muscle contraction. Obviously, a change in the shape and strength of the heart is observed in the giraffe. Two-thirds of the genes with changes are involved in skeletal, cardiovascular, and neural development. Several of the genes are involved in multiple areas of influence, including metabolism, growth, and cardiovascular function. In other words, the giraffes unique features all co-evolved. It’s not a case of, the giraffe got a long neck and then got a strong heart (or vice versa) and then got a metabolism that could handle otherwise toxic foods. Incremental changes to these genes over long periods of time, resulted in the animal we have today. But more importantly, they note that because they know which genes are involved in changing the shape and function of the heart, this may lead to some advanced cures for human heart conditions, like, hypertension. With our new, really cool, gene editing techniques, it may be possible to edit away the most common cause of death. Agaba, M. et al. Giraffe genome sequence reveals clues to its unique morphology and physiology. Nat Commun 7, (2016).